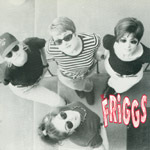 Are the Friggs big rock stars now? In my mind, once you have a song of yours appear in a movie, you're well on your way to having your own Behind the Music. Maybe my concept of the whole fame n' fortune thing is a little out of whack. At any rate, they're probably got a few more people who've heard their song than had prior to its inclusion in Jawbreaker. The song of which I speak is, of course, "Bad Word for a Good Thing," which must have come out in '93 or so. Good song. I played it a lot back in the early days of my college DJ career. I think I probably put it on a mix tape or two. And I was just as surprised as the next SFTRI fan when I heard it crop in a crap-fest like Jawbreaker. So, I figure they're big rock stars now. Of course, I can't think of a lot of releases since that one, other than this 7" I've got here. It's all right. Nothing to distinguish them from the seemingly unending hoardes of people doing the surfy-garage thing. "Shake" consists of a pretty boring surf guitar riff, which periodically stops so they call all yell "Shake." Snore. "Wild Love" is a non-catchy pop song. What's the point? See, this is the downside to being big rock stars. You have to deal with vicious snarkiness from indie snobs like me. Ha. Take that, Friggs!